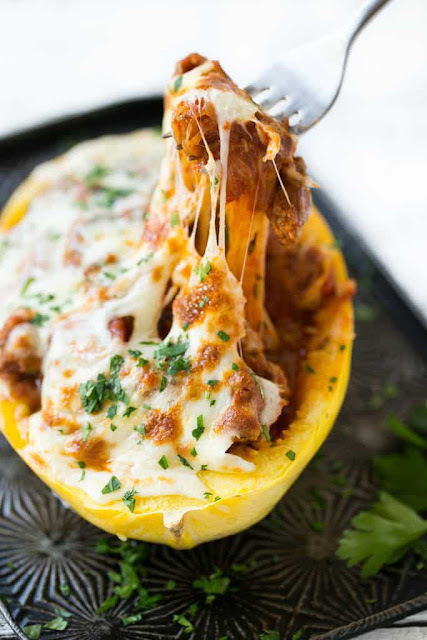 If you have never had Italian Spaghetti Squash Boats, you have truly been missing out. Spaghetti squash looks similar to spaghetti noodles, only in vegetable form! It is a great way of sneaking vegetables into your meals. Spaghetti squash stuffed with turkey sausage and marinara sauce, then topped with cheese and baked to perfection. Place the spaghetti squash halves cut side down in a rectangular baking dish. Add water to come up 1 inch in the pan. Using a fork, remove most of the flesh of the squash, leaving the shells behind. In a large pan heat the olive oil over medium-high heat. Place the turkey sausage in the pan and cook, breaking up the meat with a spatula, for 5-7 minutes or until cooked through. Add the marinara sauce and spaghetti squash into the pan; season to taste with salt and pepper and stir to combine. Cook for 3-5 minutes, stirring occasionally until the sauce is warmed through. Preheat the broiler. Divide the spaghetti squash mixture between the two shells and sprinkle the cheese over the tops. Broil for 3-5 minutes or until cheese is melted and browned. Watch carefully so that it doesn't burn! 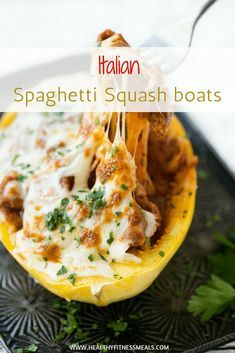 0 Response to "ITALIAN SPAGHETTI SQUASH BOATS"